Is Fort up for adoption? Fort St. George – Will it fare better in private hands? A recent report to the above effect had those concerned with this historic precinct rubbing their eyes in disbelief. For those not in the know it said that a conglomerate that had “interests in cement, power and sugar” had offered to take over the maintenance of the place under the “Adopt a Heritage” (sic) programme of the Central Government. Given the business areas in which the group is said to be, it appears that this is the same entity that has been awarded the maintenance of the Red Fort in Delhi, at a throwaway price. That decision raised quite a ruckus, but Chennai being far away from the national capital and with but tepid local interest in the welfare of the fort here, it would appear that the business group is more or less assured of getting the contract. That is if the local Government does not object. This however seems unlikely at present. There is of course much to be said both in favour of, and against, the idea. Let us look at the positives first. The fort as it stands today is pretty much in a shambles. Large sections of it are in a state of collapse including the King’s Barracks, Wellesley House, Last House on Snob’s Alley and Clive’s Library. Those that are standing are in an appalling state of maintenance and that includes the Assembly and Secretariat Building. The sole exceptions are Clive’s House (now the office of the ASI), the Exchange Museum and the Church of St. Mary’s. A contract to a private business house may ensure much needed funds and a drive to restore the structures. Also, even in terms of general cleanliness, in which aspect the Government has repeatedly come a cropper, such a private agency may prove a better performer. Two years after it was launched, the Chennai Smart City Project has come alive. According to the AMCHAM-PwC Smart Cities Report, of the 44 projects in Chennai, as of December 2017, five were under implementation, 32 had not started and the rest were in pre-tender stages. There is no clear indication of the target completion dates for different projects either in the Report or in the illustrated project details extensively publicised in the newspapers. It is known, however, that the Smart City Project has a five-year time frame ending 2022. Madras State did not become Tamil Nadu State in a day. ‘Thiyagi’ Sankaralingam, a Congress Party worker who was behind the first demand to change the name, in the 1950s, made repeated representations. But to no avail. 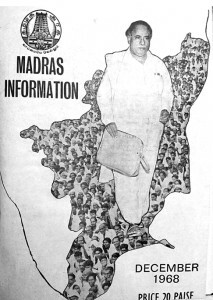 The DMK emphasised its demand for such a change on entering the Assembly on May 7, 1957. There were just 42 votes in favour of the resolution and it was defeated. However, the DMK continued to represent on this demand. On January 30 1961, the Socialist Party legislator Chinna Durai brought a resolution to change the name from ‘Madras State’. In order to win that resolution, he requested that the ruling party members vote in its favour. 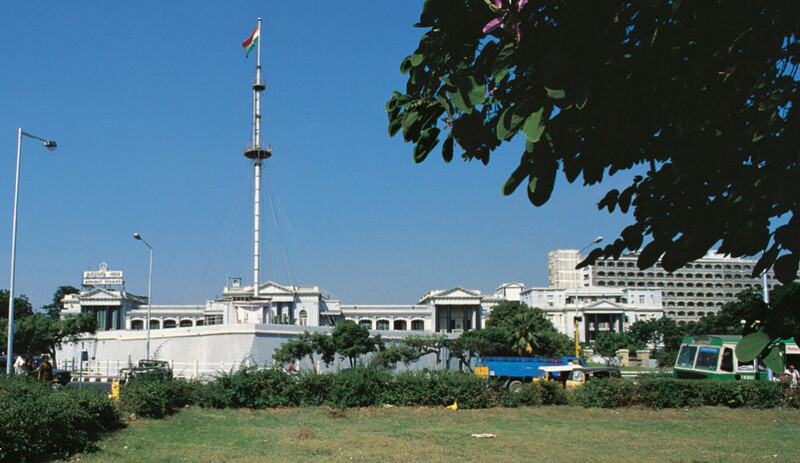 This led to Chief Minister Kamaraj postponing the discussion on the demand for a month. The DMK boycotted the Assembly for three days protesting against the delaying tactics of the Government. Pavithra Srinivasan is a writer, journalist, artist, translator, columnist and an editor and is fascinated with History. 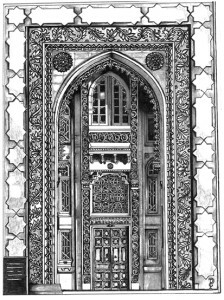 The first time I saw the National Art Gallery was as an oblivious nine-year-old, out on my first-ever school excursion; I remember gazing at the imposing structure with unseeing eyes (my friends’ chatter was all-consuming, those days) and rushing past. 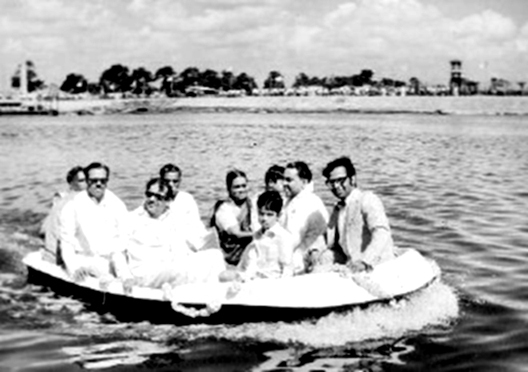 Kalaignar Karunanidhi and members of his cabinet enjoy a boat ride on the Cooum. You just could not deny it – Kalaignar Karunanidhi was a go-getter and an achiever. The various accusations of corruption apart, the man was known for his speedy implementation of any scheme that took his fancy. That he came a cropper in some, the Veeranam Water Supply project being the foremost, did not really deter him. There were several others that came to happier conclusions. One that sadly did not, was the Cooum Improvement Scheme.